Four and a Half eggs! This is what the hens produced today. Does it mean that one of them has run out of egg producing material? 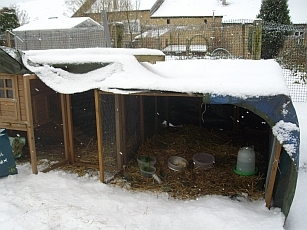 Apart from that, all five hens seem to be getting used to living in Arctic conditions. They have even begun to venture further from their ‘paths’ between the henhouse and the shelters and investigate the far reaches of the garden. I’ve tried to vary their diet and make sure they have extra protein to make up for the lack of insectiverous treats as well as providing extra rations of grain mix but they are fussy little things. They turn up their beaks at vegetable peelings now and even shunned warm porridge recently. They don’t even appreciate bread soaked in warm water as much as they used to but they LOVE raw beef, yoghurt and custard! 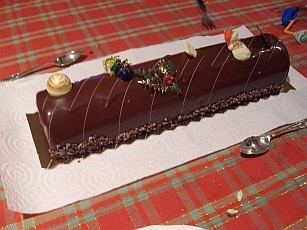 The Christmas festivities went well – a Franglais Reveillon, a late Christmas day lunch with turkey but Buche instead of pudding as this gorgeous concoction is much lighter after a large main course. We saved the pud for Sunday when we invited our friends from the next village. They were a bit anxious about travelling but braved the icey conditions even though they dare not stay too late. After a quiet and lazy day yesterday fate conspired to pay us back today. As soon as I got up and went to prepare the hens’ breakfast I heard an ominous dripping in the ‘summer kitchen’ and found a wet floor and water in my store cupboard, coming from the ceiling. CC and Jay were dragged out of bed and we formed a chain to empty the supplies before they were completely ruined. There was less damage than I’d feared as it was mostly a case of cardboard packaging being soaked while the contents remained dry. It seems the tap for the well water in the garden shed above was the culprit. 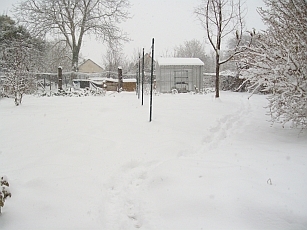 I had turned off the water and left the tap open but ‘water finds it’s own level’ and as the hose goes up a steep incline to the vegetable patch the slight thaw must have sent water back down to the shed. Anyway, the floor was awash! I put a large container under the tap and disconnected the hosepipe. Hopefully it will dry up eventually. Then it was Bear’s turn to cause chaos. He backed the car out of the garage and couldn’t get it back in. There is no more salt to be found in any of the shops so I had put sawdust on the path to the door and down the drive but it wasn’t working. Eventually Jay and I had to tip a large quantity of ash down to make a ‘path’ for the wheels and – what a relief – he made it into the garage at last. But what a mess it has made. 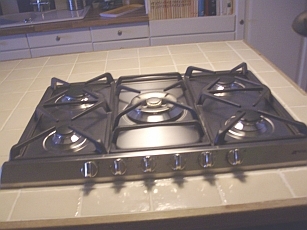 I had only just finished washing the floor when the nurse came and, having walked through the ash, trod it all over the house once more. . . .
that we have now installed a new gas hob which arrived just in time for Christmas. The kitchen makeover? Well, it’s almost finished. The tiling is done but there is one wall that needs to be stripped and painted and a few places where wood needs varnishing. It’s some time since I posted about Bear and his moods but that doesn’t mean he’s a changed character. Yesterday, for example, CC had an appoimtment in town. Jay’s car is in for repair and so I suggested that he used Bear’s car to drive CC and me as I’m still abit nervous about parking – not to mention driving in this weather. Bear has found it too painful to walk much recently so I didn’t think he’d want to take us himself. How wrong can you be? He insisted that HE would drive us in. “But you’ll get cold sitting in the car and you really shouldn’t walk round on your own. The pavements can be treacherous in this weather.” I protested, but to no avail. In fact, he proudly proclaimed during lunch that he was getting one over on Jay by not letting him drive the car. Normally Bear is a stickler for time keeping but it wasn’t his appointment so he didn’t seem in such a hurry. There were a few hold-ups thanks to roadworks and driving conditions and we arrived in Cours Briand with two minutes to spare. This was not a good time to discover that between us there wasn’t enough change for the parking metre. We rustled together a collection of 5 and 10 centime coins. “You’ll have to go to a shop and get some change.” said Bear. “You”ve got half an hour to find your own change”, before dashing off with CC. We just made it to the orthodontist for 2 o’clock and his assistant took x-rays before we went in to see him. CC didn’t persevere with her brace as a child and is suffering now, as an adult, but we were both shocked when he announced that the main problem was her tongue when she swallows and so she would have to see a speech therapist to re-educate it. Then he talked about braces and it looks as though she’ll have to wear one for over a year. I looked at CC, opened and closed my mouth and decided not to say anything inflammatory. Bear let it be known that it had taken him a good half an hour to find some change for the metre then continued as though nothing had happened. But later, CC told me that he had apologised to HER!! I thought we had escaped the bad weather for too long and today it has caught up with us – well and truly. Jay and I walked to the bakers this morning and really enjoyed crunching over the (almost) virgin white snow but the cats and chickens are not so happy. The cats usually queue up to dash out of the window as soon as it’s light but this morning only two braved the ice cold draught but went put of the window and then straight to the door to come in. They are all curled up happily in the warm now. Not so the hens. 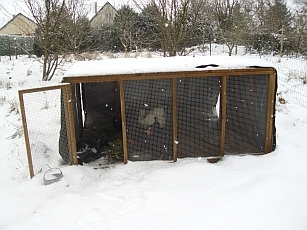 They have two shelters – with the open side facing in opposite directions but they are decidedly miserable. The snow is getting deeper and they don’t like walking over it. Even at bedtime I have to lift some of them into their house for the night. Hilda, the Sussex hen, is the only one who puts herself to bed before I get there and sometimes Susie joins her but the others are usually making sad little noises from underneath the tarpaulin and scratching fruitlessly at the bare earth before having a last drink of water as a ‘nightcap’. 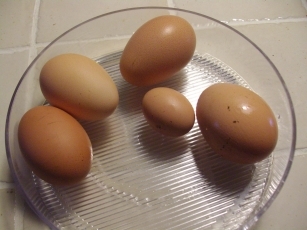 They are all still laying an egg a day despite seeming less interested in food. Apart from their grain, which they peck at eagerly, they show little interest in many of the other treats I take them such as cabbage or lettuce, and bread soaked in warm water. However, they greedily gobble chips, bacon or fish if I can offer them any such leftovers. Their water needs checking regularly as, even under cover, it can freeze. If any experienced poultry keepers can give me some hints on keeping them happy over Winter I’d be very grateful. Thanks. 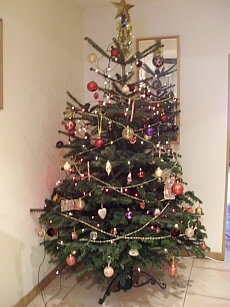 One thing about this weather is that it puts me in the mood for Christmas and we took advantage of the local Garden Centre having a 15% discount day to buy our tree. CC decorated it yesterday and we got the season off to a good start with mince pies and mulled wine while playing Ella Fitzgerald’s Christmas album: all a bit earlier than usual but, never mind, eh!